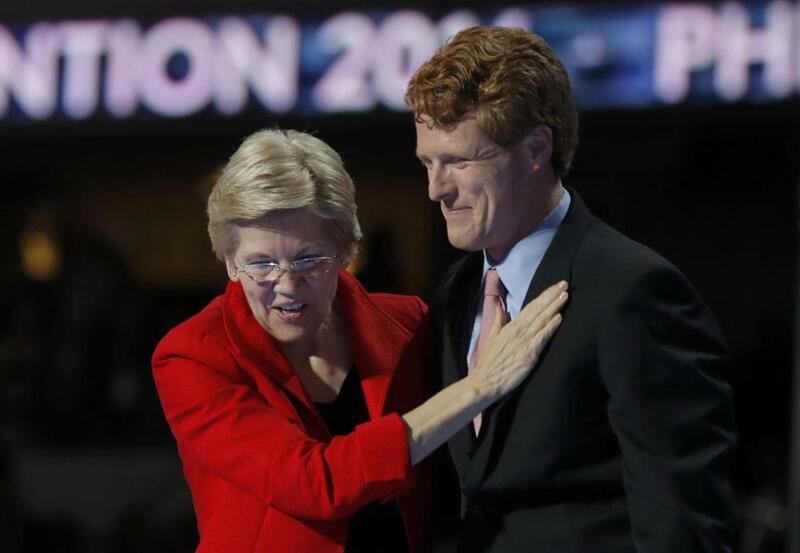 US Representative Joseph P. Kennedy III (right) introduced US Senator Elizabeth Warren on Monday. First day of law school. First class. The goal: escape unscathed. I never showed up unprepared for Professor Elizabeth Warren again. She was the toughest teacher on campus, but the wait list for her class was a mile long. She pushed us hard. She brought out our best. She believed in us. And she believed in the law — not as an abstraction but as a living force with the power to make life better or worse. She taught us that its impact lay not in classrooms or textbooks . . . but in a society where wages have not budged in four decades, where 2.5 million children are homeless, where we expect 1 in 3 black men to go to prison. Our laws have human consequences. That fact fueled a law school professor to take on this country’s most entrenched financial interests. It brought a middle-class champion back to a Massachusetts senate seat. And it led a first-term US senator to become our government’s gut check. In a sea of power and privilege, Senator Warren is an anchor for the voiceless and victimized. She asks more from all of us because she believes deeply in each of us. That faith, in our country and the American people, is the foundation of the Democratic Party. It echoes through this arena tonight — and through every classroom, hearing room and living room that Senator Elizabeth Warren has touched. Ladies and gentlemen, it is my honor to introduce Elizabeth Warren!